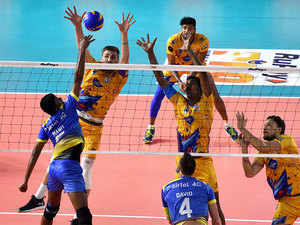 MUMBAI: After tasting success with the inaugural season of Pro Volleyball League (PVL), the IPL-style franchise-based league for volleyball, sports marketing firm Baseline Ventures, the league owners and Volleyball Federation of India (VFI), have set a big target — to make PVL India’s second biggest league. While PVL had a short first season (21-days, 6-teams), the league will be adding two more franchises ahead of second year, which is being planned around October-November this year. “It’s very humbling to know that PVL has so done well in its first season itself with all the feedback that we have received from sports fans in India, from viewers across the globe and also from VFI and the global body FIVB,” Tuhin Mishra, co-founder and managing editor, Baseline Ventures, told ET. He said that the company is “very optimistic” of the prospects because of the sport’s huge appeal, both at urban and rural areas as well as the quality of Indian players combined with top International players. “PVL will scale greater heights. With the possible addition of more teams in season 2, the canvas of PVL will be much larger going forward and will help us in our mission of being the No. 2 league in the country,” said Mishra. Experts reckon that while the first season was good, reaching number two will not be a cakewalk for PVL, which is far behind the existing leagues, including the Indian Premier League (IPL), Pro Kabaddi League (PKL) and Indian Super League (ISL), which are much bigger in terms of revenue, number of franchises and duration of the leagues. “Pro Volleyball League was well presented on TV. However, for a league to scale and sustain, the federation will have to do many things that will eventually build a fan base. Also, it’s important to keep the sport relevant through the year and keep the fans engaged,” said Vinit Karnik, business head, of ESP Properties, a division of GroupM. However, PVL owners feel the time for volleyball has come. In fact, as per the post-event report by Nielsen Sports & Entertainment, TV viewership for PVL in season 1 was considerably higher than the badminton and table tennis leagues, which have already completed four and two seasons, respectively. In terms of engagement, or time spent per viewer (TSV) also, PVL was significantly higher at 12.1 minute, compared with Premier Badminton League 2016 (8.4 minutes), Ultimate Table Tennis 2017 (4.4 minutes), Premier Badminton League 2019 (8.1 minutes) and Pro Wrestling League (11.2 minutes). This was despite the fact that the league clashed with the new TRAI tariff regime, which started from February 1 and led to a decline in reach across all channels with weekly reach dropping by close to 40%. PVL was also broadcast across 33 countries. For the Indian subcontinent, the rights were with Sony Pictures Networks (SPN), while Dubai Sports aired the matches in Thailand and the Middle East and North Africa region and Singtel in Singapore. On digital platform, PVL had reached to 1.3 million viewers, while the league also initiated the launch of the first time ever globally, a fantasy league for volleyball, which achieved a total of 178,952 active players on the day of the final. Also, PVL was watched live in over 45 countries worldwide and garnered a total reach of 161,157 people over the course of the tournament.